One of the United States's most prolific (producing a lot of work) and versatile (producing a wide variety of work) contemporary writers, Joyce Carol Oates focuses upon the spiritual, sexual, and intellectual decline of modern American society. Joyce Carol Oates was born on June 16, 1938, in Lockport, New York, the oldest of Frederic and Caroline Oates's three children. The family lived on a farm owned by Caroline's parents. Joyce's father was a tool designer, and her mother was a housewife. Oates was a serious child who read a great deal. Even before she could write, she told stories by drawing pictures. She has said that her childhood "was dull, ordinary, nothing people would be interested in," but she has admitted that "a great deal frightened me." where she studied English. Before her senior year she was the co-winner of a fiction contest sponsored by Mademoiselle magazine. After graduating at the top of her class in 1960, Oates enrolled in graduate school at the University of Wisconsin, where she met Raymond Joseph Smith, an English professor. They were married in 1961. In 1961, after Oates earned her master's degree and began work on her doctorate in English, she found one of her own stories in Margaret Foley's collection Best American Short Stories. Oates then decided on a writing career, and in 1963 she published her first volume of short stories, By the North Gate (1963). Oates also taught at the University of Detroit between 1961 and 1967. In 1967 she and her husband moved to Canada to teach at the University of Windsor, where together they founded the publication Ontario Review in 1974. 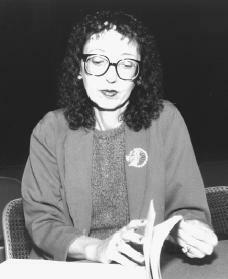 After leaving the University of Windsor in 1977, Oates became writer-in-residence and later a professor at Princeton University in New Jersey. Oates's first novel, With Shuddering Fall (1964), shows her interest in evil and violence in the story of a romance between a teenage girl and a thirty-year-old stock car driver that ends with his death in an accident. Oates's best-known early novels form a trilogy (three-volume work) exploring three different parts of American society. The first, A Garden of Earthly Delights (1967), tells the story of the daughter of a migrant worker who marries a wealthy farmer in order to provide for her illegitimate (having unmarried parents) son. The woman's existence is destroyed when the boy murders his stepfather and kills himself. In Expensive People (1967), Oates exposes the world of people in the suburbs whose focus on material comforts reveals the emptiness of their lives. The final volume, them (1969), which won the National Book Award for fiction, describes the violence and suffering endured by three generations of an urban (city-dwelling) family in Detroit, Michigan. Oates's experiences as a teacher in Detroit during the early 1960s contributed to her knowledge of the city and its social problems. Oates's novels of the 1970s explore characters involved with various American professional and cultural institutions while adding tragic elements. Wonderland (1971) is about a brilliant doctor who is unable to build a satisfying home life. Do With Me What You Will (1973) focuses on a young attorney who is honored by his peers for his devotion to social work. The Assassins: A Book of Hours (1975) deals with the effects of the murder of a politician on his wife and two brothers. Son of the Morning (1978) documents the rise and fall of a preacher whose faith is challenged and made stronger by various events in his life. Unholy Loves (1979) revolves around the lives of several teachers at a small New York college. During the early 1980s Oates published several novels based on works by nineteenth-century authors. A Bloodsmoor Romance (1982) is the story of five maiden sisters living in Pennsylvania in the late 1800s and is influenced by the writings of Charlotte Brontë (1816–1855) and Emily Brontë (1818–1848). In Mysteries of Winterthurn (1984), Oates borrowed heavily from the works of Edgar Allan Poe (1809–1849). While some critics dismissed these works, others, citing Oates's accomplished description of evil, maintained that they are significant achievements in literature. Throughout Oates's writing career she has distributed her energies among several projects at once. Her book-length essay On Boxing (1987) led to at least one appearance commenting on a televised boxing match. Around the same time, she submitted a mystery novel to a publisher under a pseudonym (fake writing name) and had the thrill of having it accepted. Oates published the novel Lives of the Twins (1987) under the name Rosamond Smith. "I wanted a fresh reading; I wanted to escape from my own identity," Oates told Linda Wolfe in the New York Times Book Review. Though she used the name again for several other books, she resumed using her name with the publication of My Heart Laid Bare, in which she explores morality (the question of right and wrong) during the 1920s. Oates's works in other forms also address darker sides of the human condition. Most critics feel that Oates's short fiction, for which she has twice received the O. Henry Special Award for Continuing Achievement, best expresses her main themes. Such collections as By the North Gate; Where Are You Going, Where Have You Been? : Stories of Young America (1974); The Lamb of Abyssalia (1980); and Raven's Wing (1986) contain pieces that focus on violent and abusive relationships between men and women. In Because It Is Bitter, and Because It Is My Heart (1990), Oates returns to the familiar themes of race and violence. Other works from this time include Black Water (1992), an account of a tragic encounter between a powerful U.S. senator and a young woman he meets at a party, and Foxfire: Confessions of a Girl Gang (1993), which describes the destructive activities of a group of teenage girls in the 1950s. The story is pieced together from former Foxfire gang member Maddy Wirtz's memories and journal and takes place in the industrial New York town of Hammond. Oates also had several plays published and produced in the 1990s. In 1999 Oates's twenty-ninth novel, Broke Heart Blues, was published. In March 2000 Blonde, based on the life of actress Marilyn Monroe (1926–1962), was released. The book was a finalist for the National Book Award for fiction. In June 2000 Getting to Know You, a film based on Oates's 1992 short story collection Heat, was released. Oates edited the collection The Best American Essays of the Century, which was published in 2000. Middle Age: A Romance, a novel, and Beasts, a novella (a work whose length is greater than that of a short story but less than that of a novel), were published in 2001. Bender, Eileen. Joyce Carol Oates. Bloomington: Indiana University Press, 1987. Bloom, Harold, ed. Joyce Carol Oates. New York: Chelsea House Publishers, 1987.